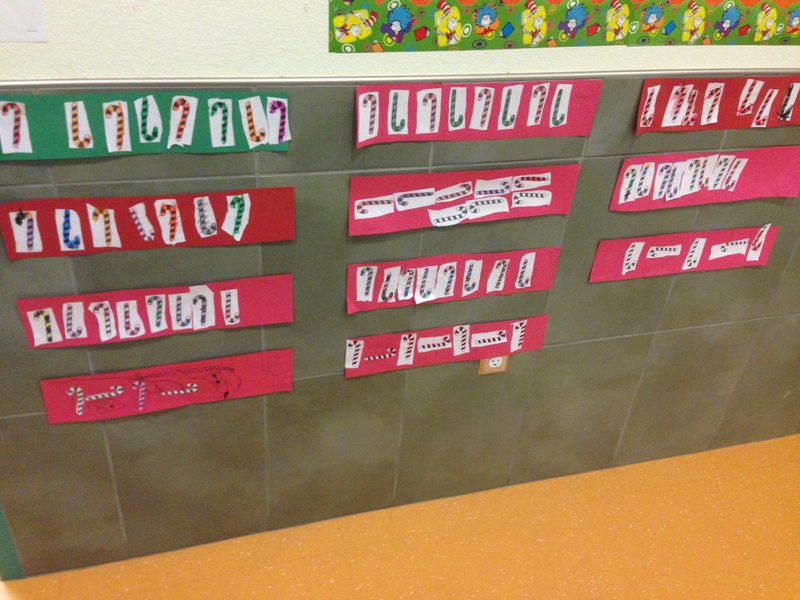 The first half of the year is already over! 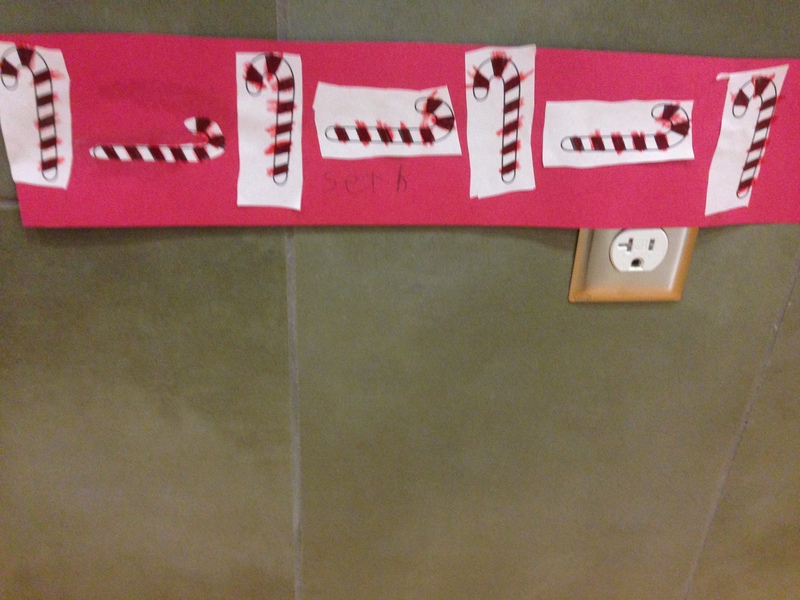 It’s hard to believe that we’ve already reached Christmas vacation. 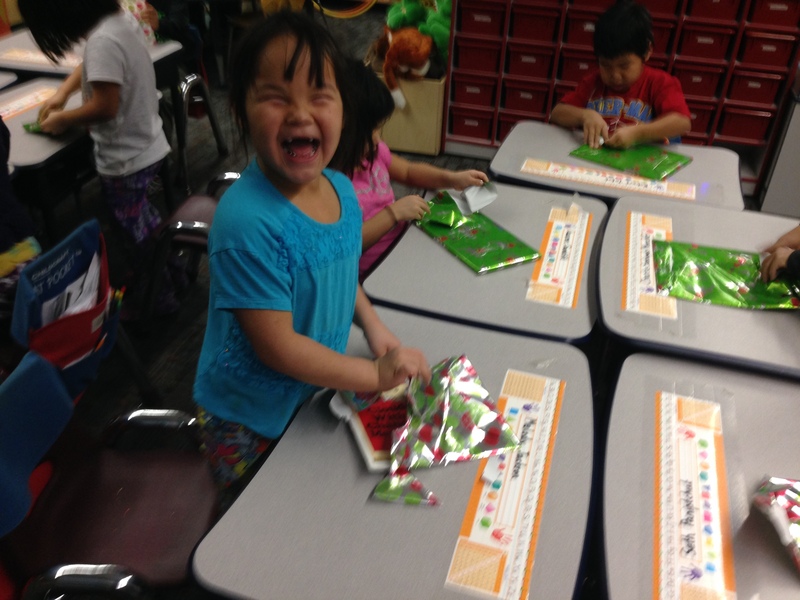 We celebrated the holidays with a holiday party. 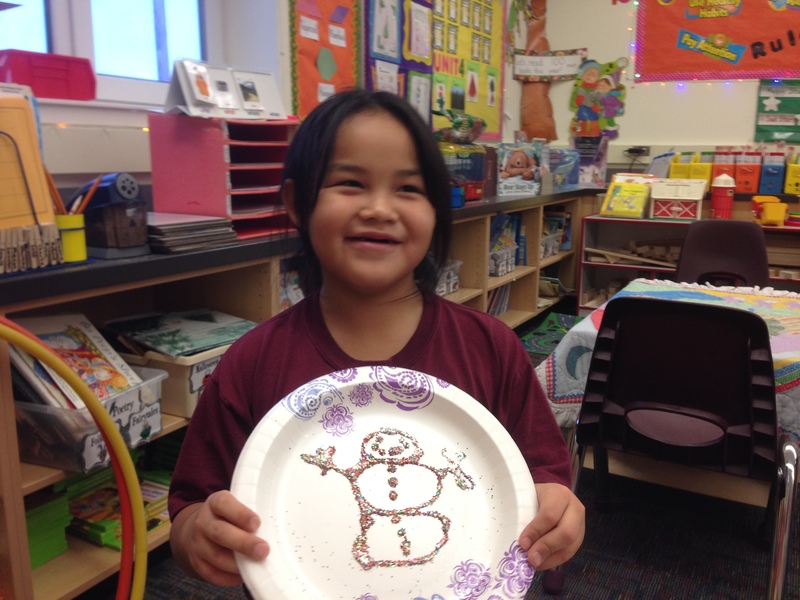 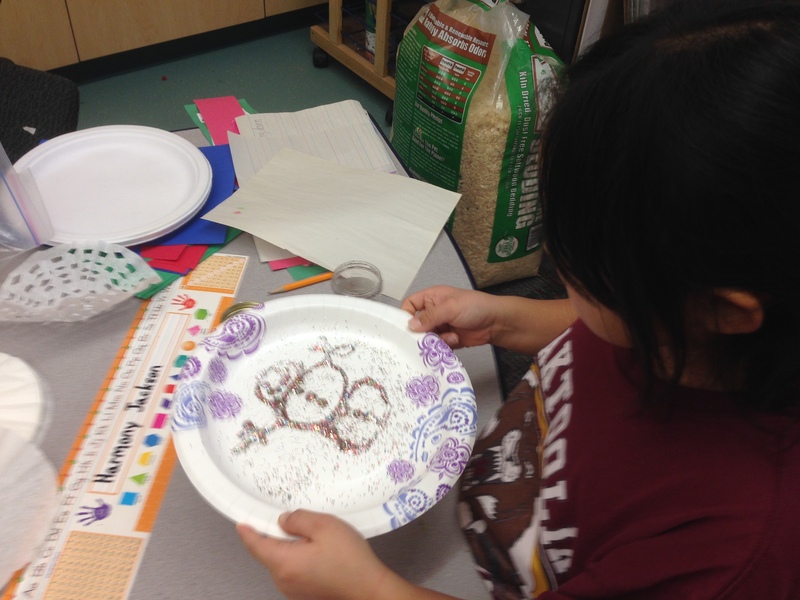 We enjoyed snacks and made Christmas crafts such as; snowflakes, Christmas pictures, hand print ornaments, and paper plate glitter ornaments. 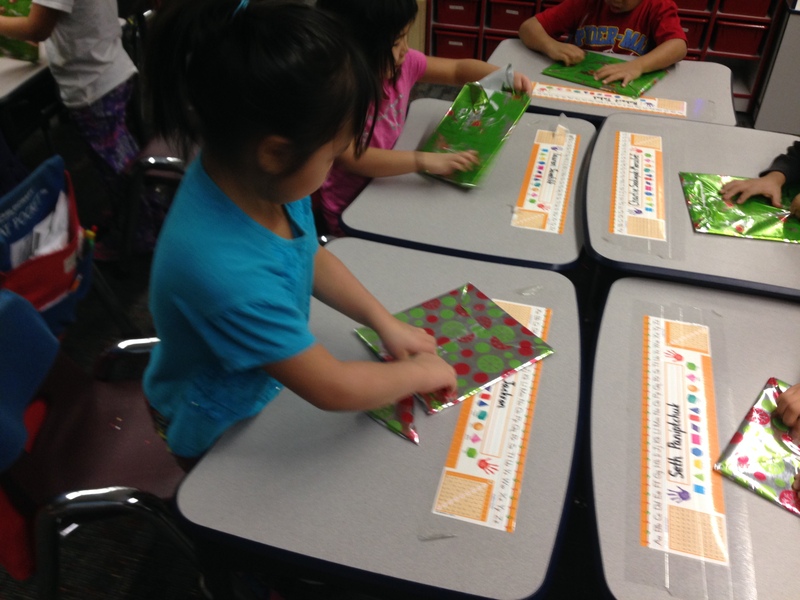 Each student made one of these crafts for another student in the class. 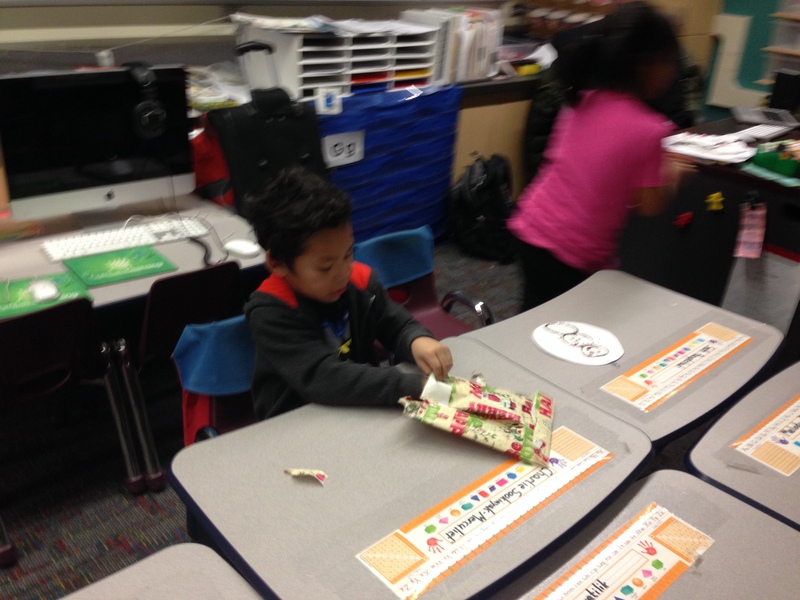 Then the next day before we released for the Christmas break students opened their presents from their classmates and Mr. Daniel! 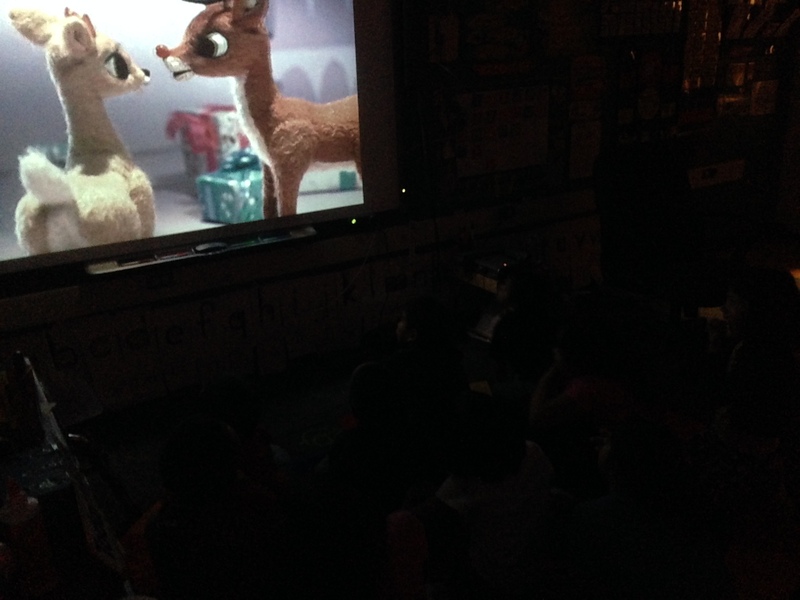 Then we sang along to some Christmas songs and watched Rudolf the Red-Nosed-Reindeer and Frosty the Snowman. 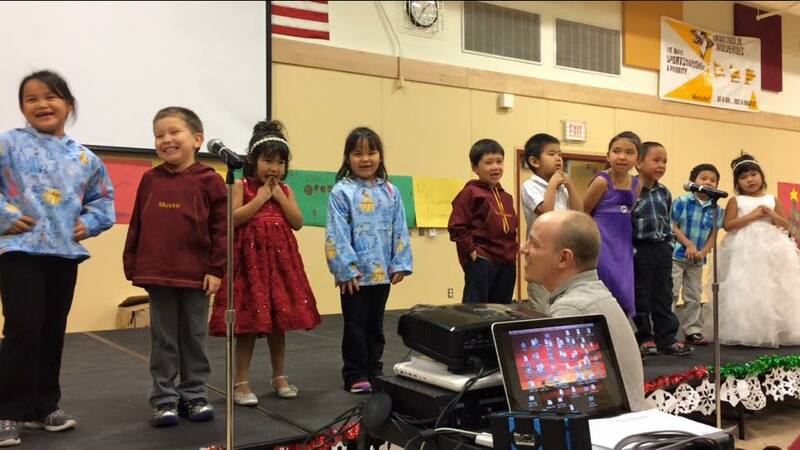 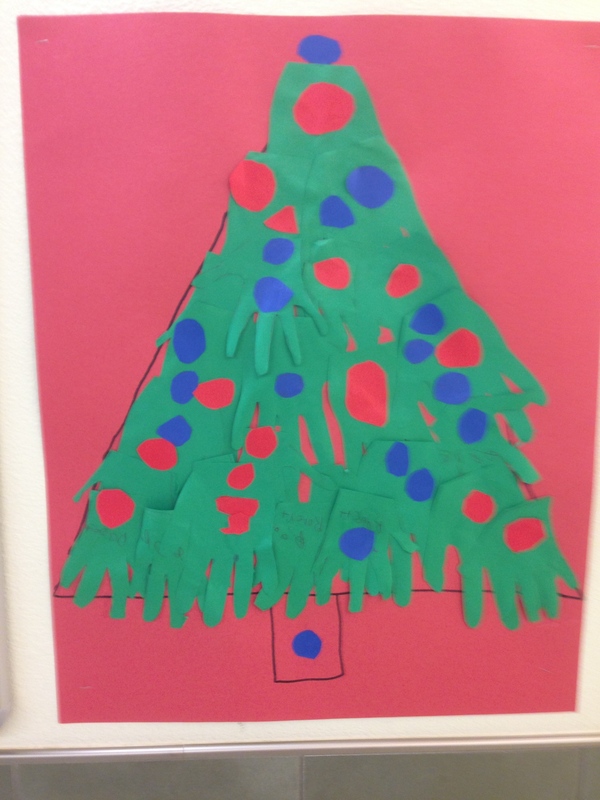 Our school put on a Christmas program for all of the village to come and enjoy. 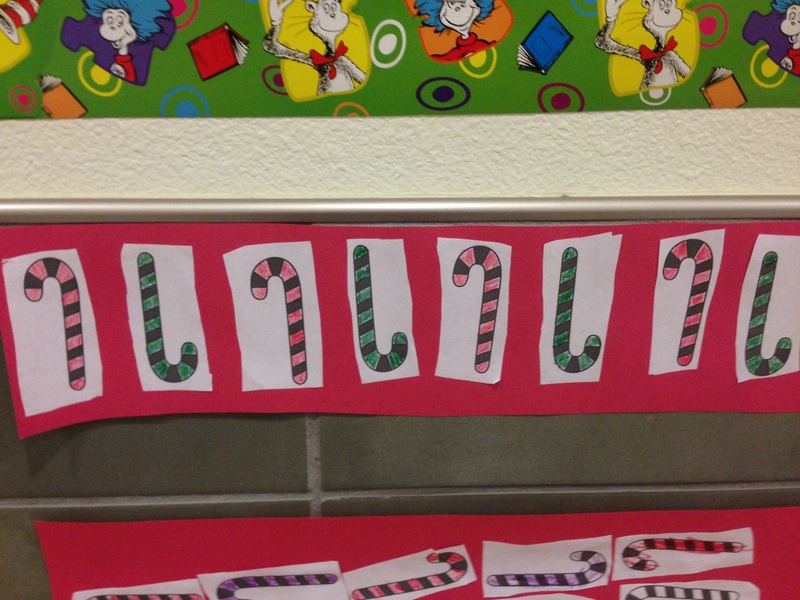 Our K-1 All-Stars have been learning ordinal numbers so what a perfect song to sing for the program than, “The Twelve Days of Christmas”. 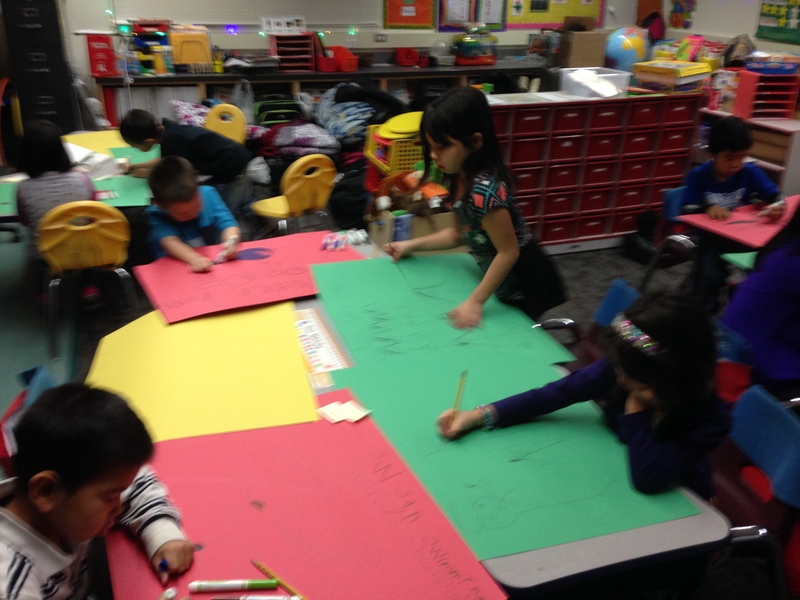 Each student created a sign for each day of Christmas and they got to act out what they got for each day of Christmas while they sang the song. 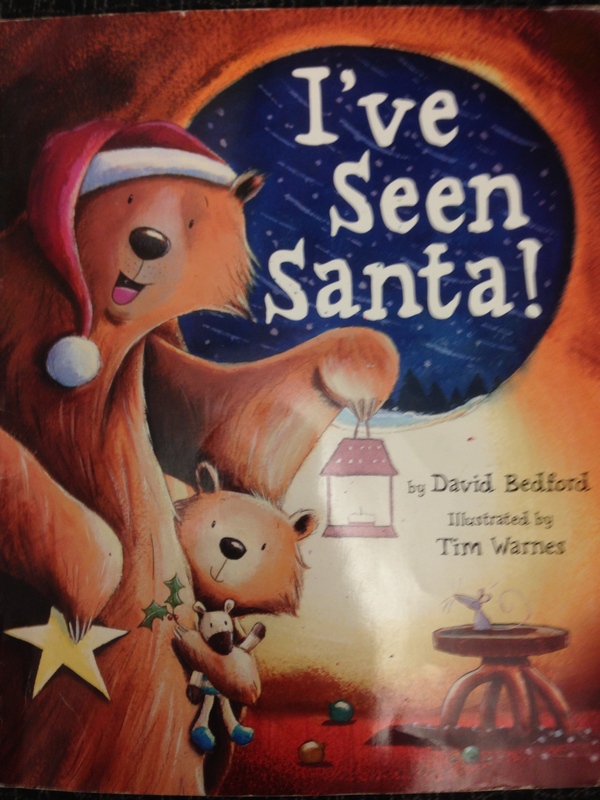 Today we read the story “Bear Stays up For Christmas” which is a book that is from the same Author’s and the same characters as one of our favorite books “Bear Snores On”. 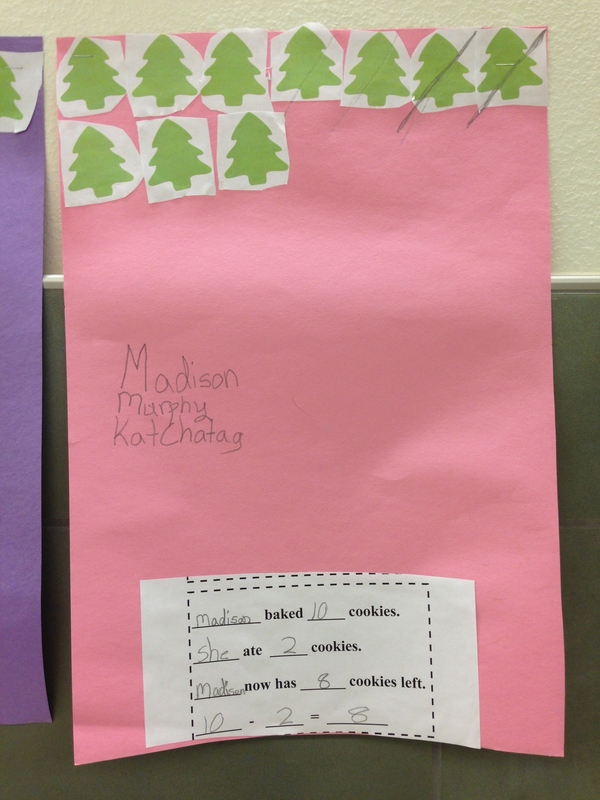 Both books also has the same kind of format with its repetitive text and rhyming. 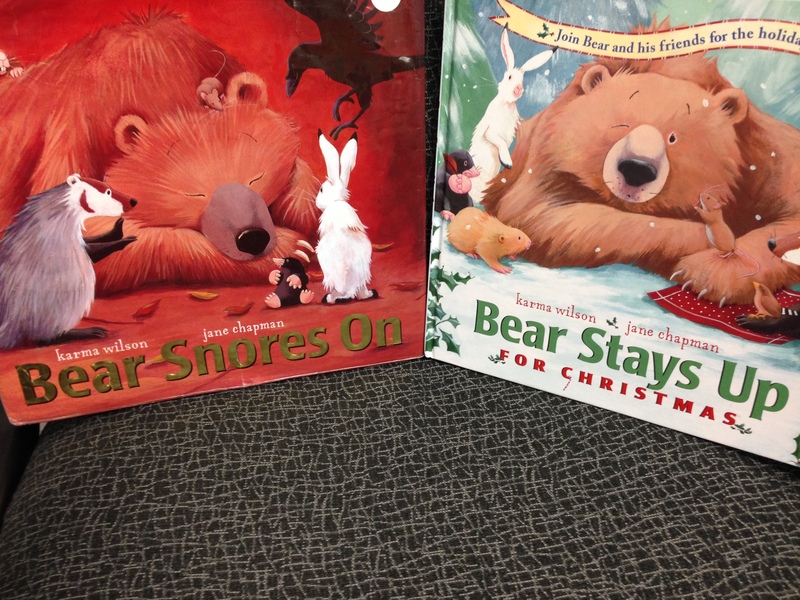 As we read “Bear Stays up for Christmas” we used our prior knowledge of “Bear Snores On” to predict what would happen next in the story. 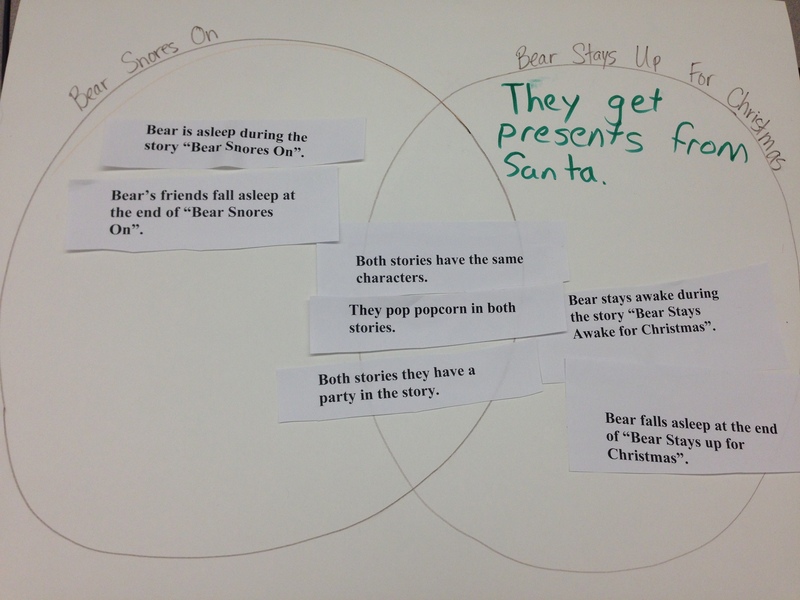 Together then we made a whole class venn diagram about how both stories were the same and different. 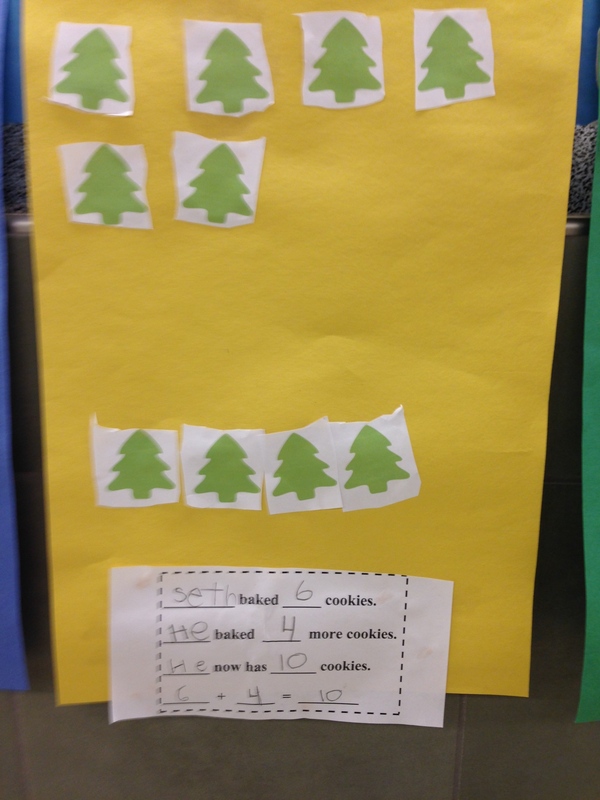 For math we continued on with our topic of composing and decomposing the number 10. 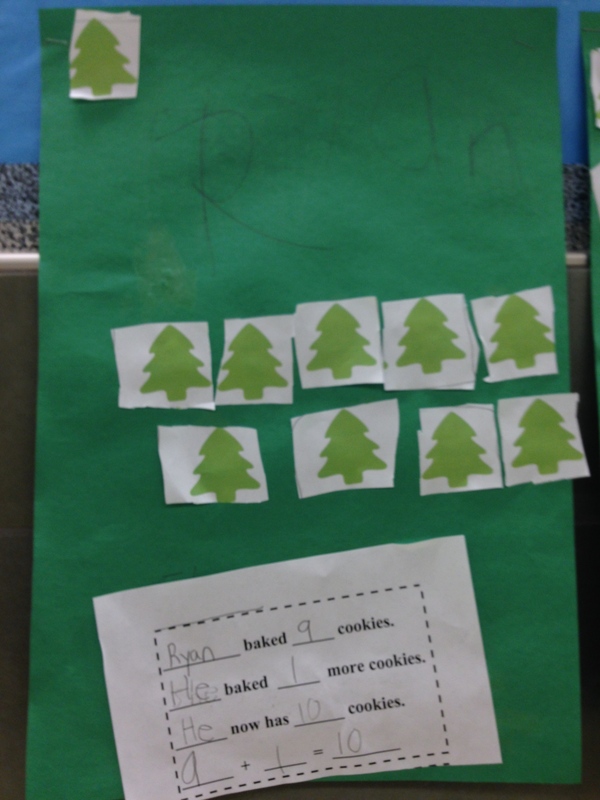 Kindergarteners wrote addition story problems about baking Christmas cookies, and the 1st graders wrote subtraction problems about baking and eating Christmas cookies. 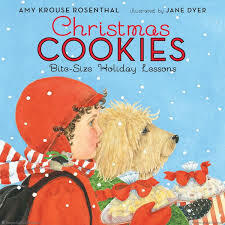 Today we read the story Christmas Cookies which is a book that introduces us to many different vocabulary words and teaches us lessons about giving and thankfulness. 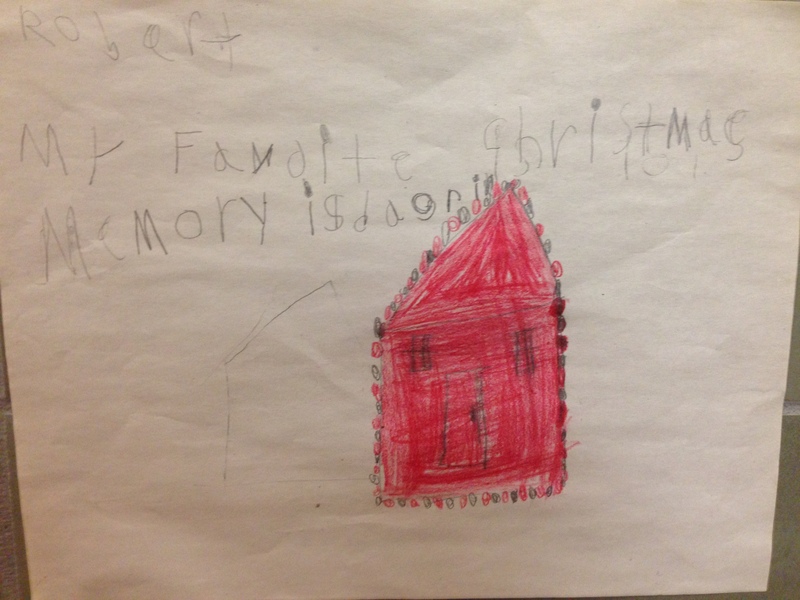 Reading this book; sparked a lot of conversations about things we remember about past Christmases and what we do during the Christmas time. 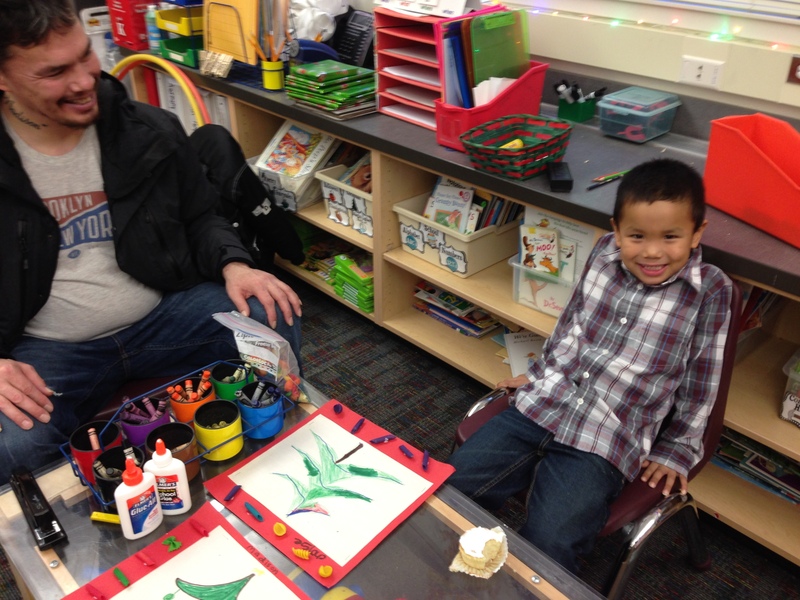 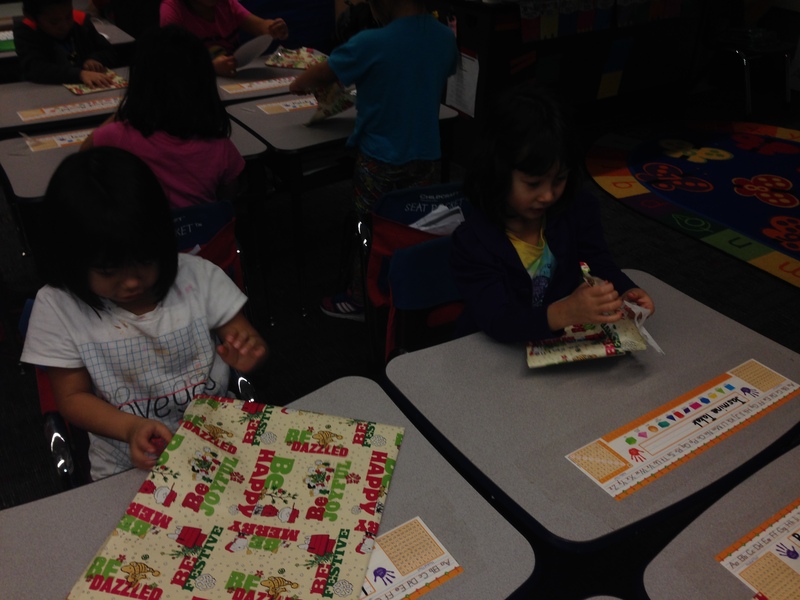 We wrote about our favorite Christmas memory and made presents for our class secret Santa. 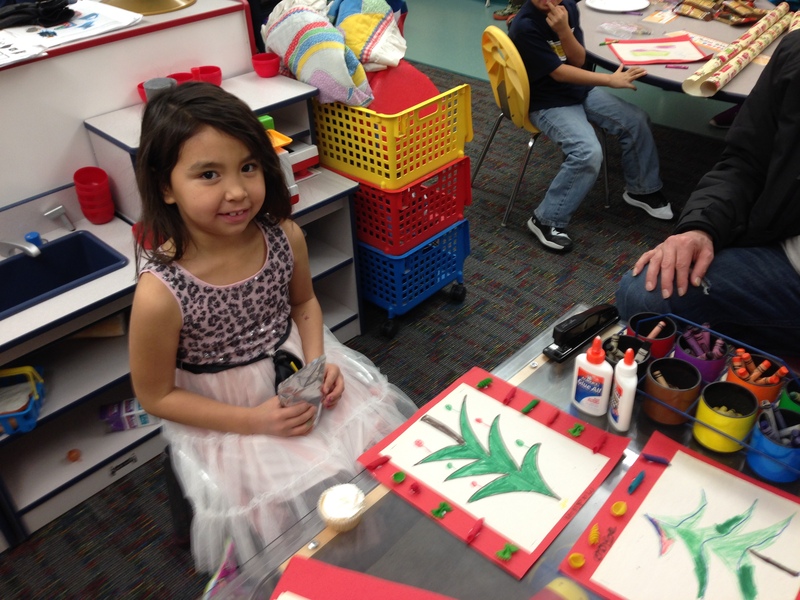 In the past 10 years or so there has been a steady increase in expectations in what students are required to learn in kindergarten. 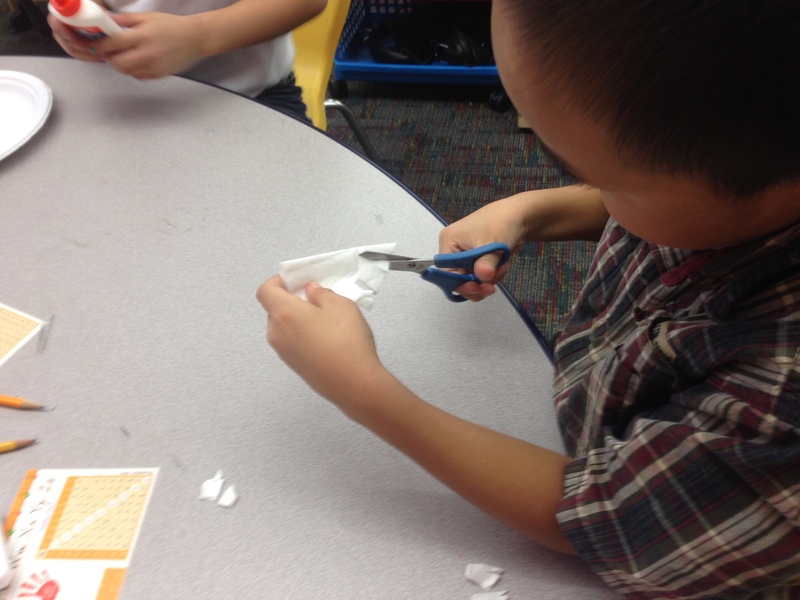 With the increase in expectations of our students; it makes it even more difficult to find activities that are not only engaging, age appropriate for young learners, but also align to state and national standards. 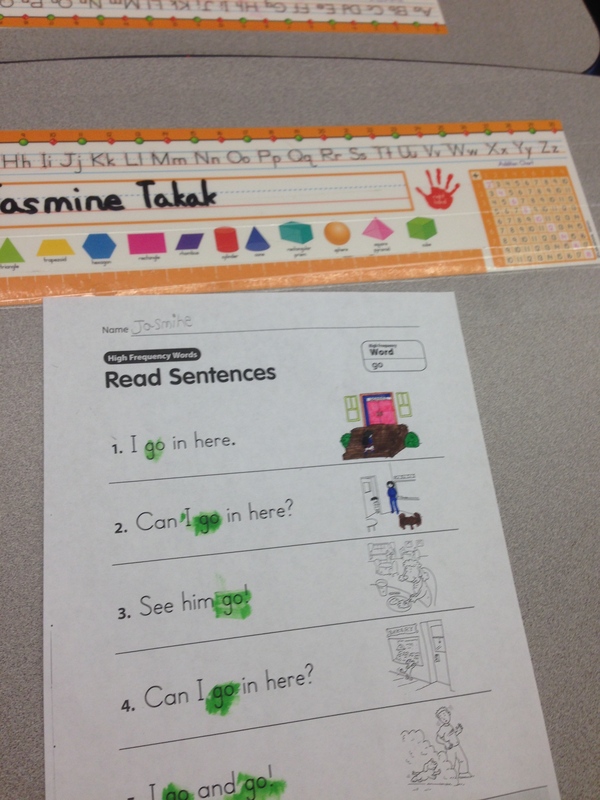 Below are some examples of centers I do during my workshop / guided reading time. 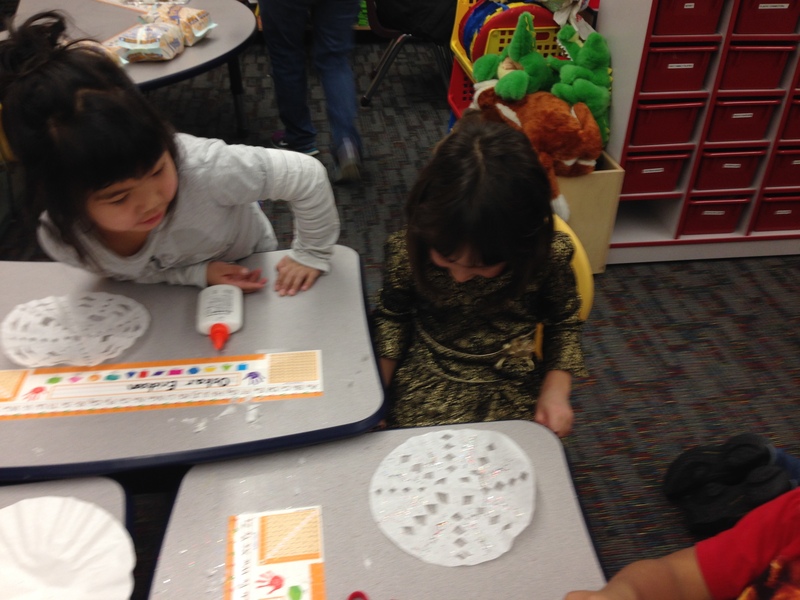 There are many different centers that are shown here. 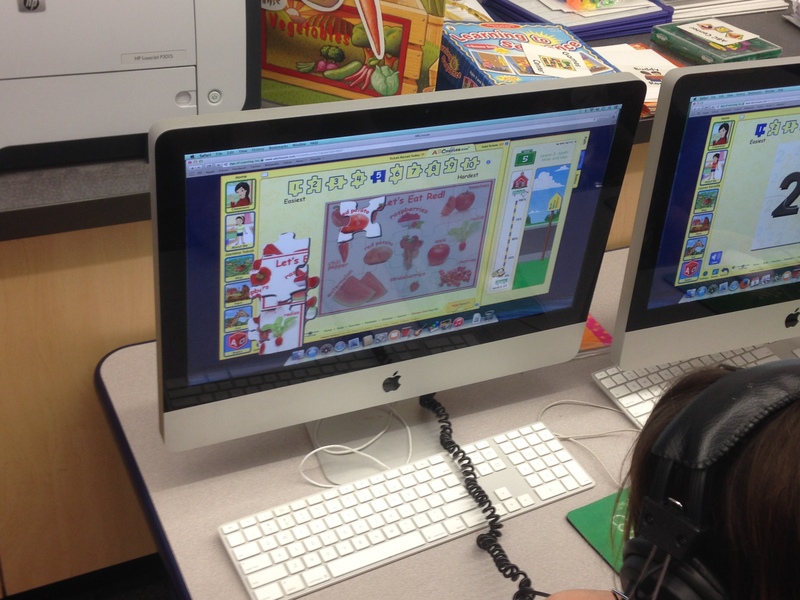 On the computers the Kindergarteners have been using a website called abcmouse.com, which is an amazing website free to all public school teachers. 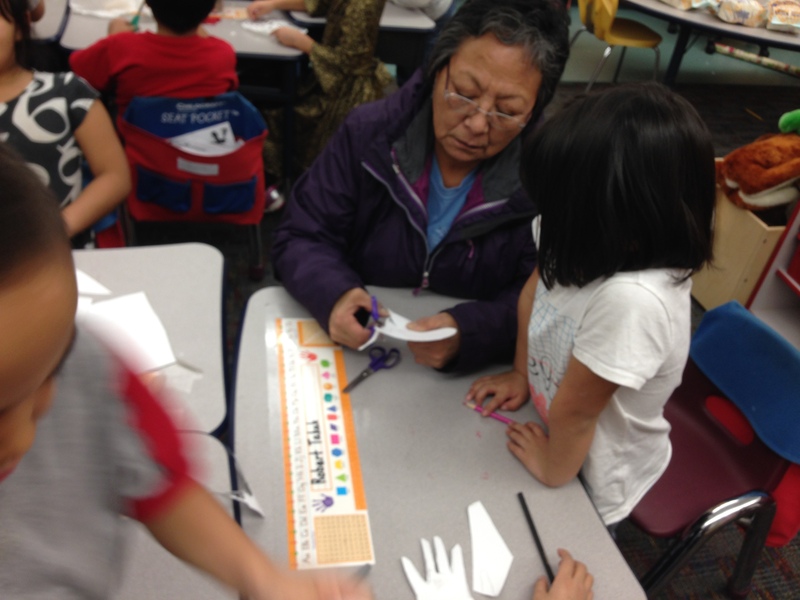 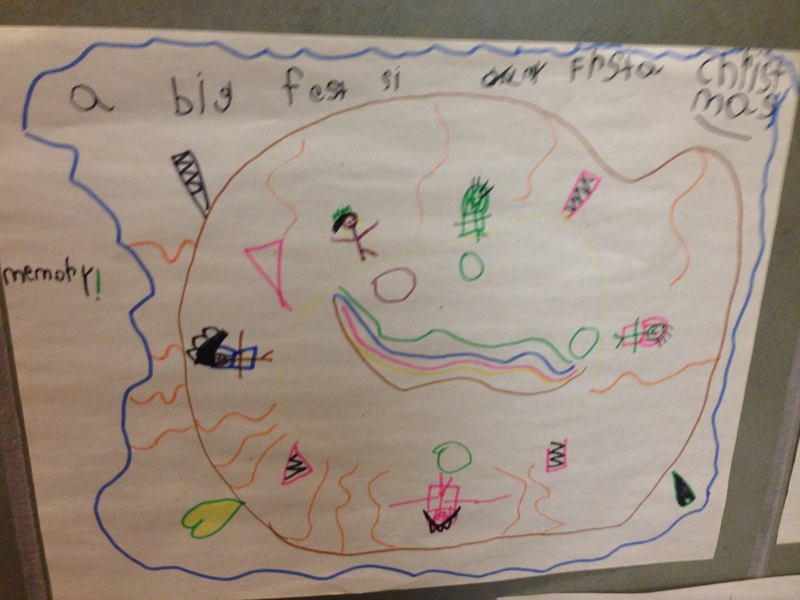 It has a whole plethora of supplemental activities that range from early literacy, math, and even science. 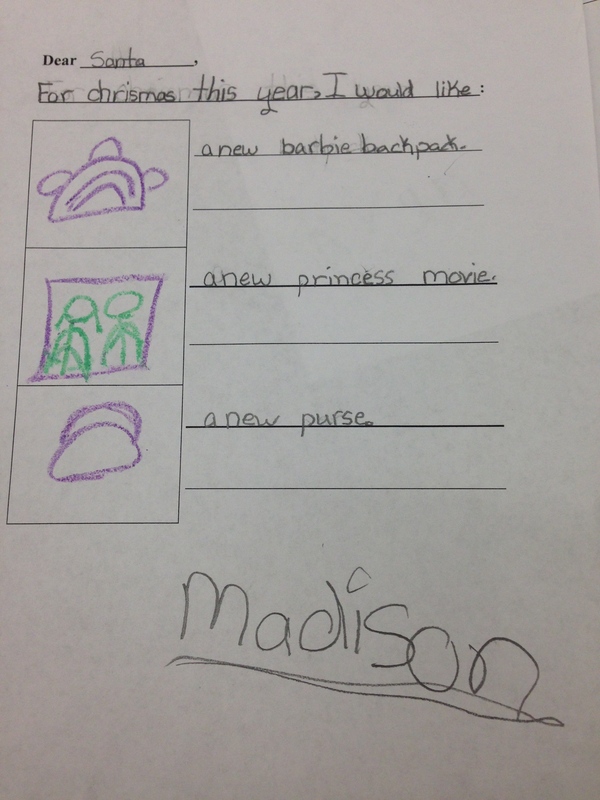 You can create a login for all students and place them at different levels based on their academic needs. 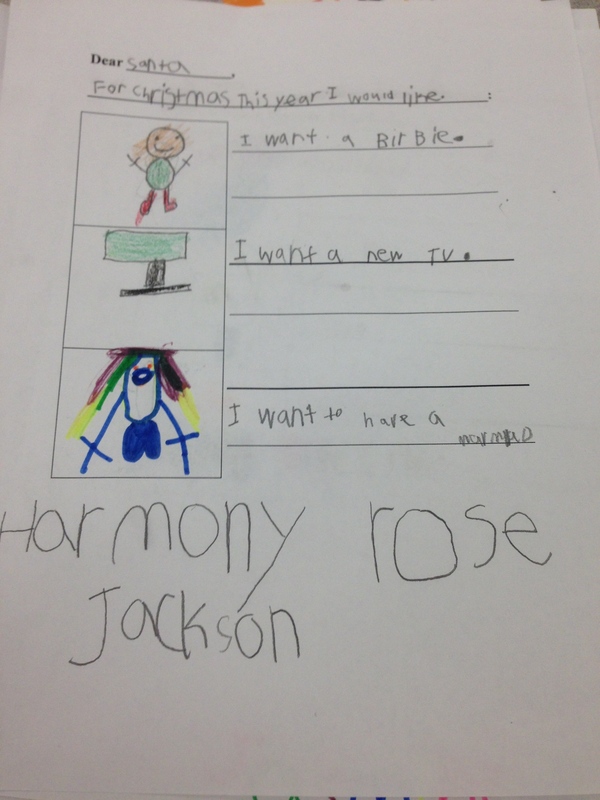 It’s a great program for RtI. 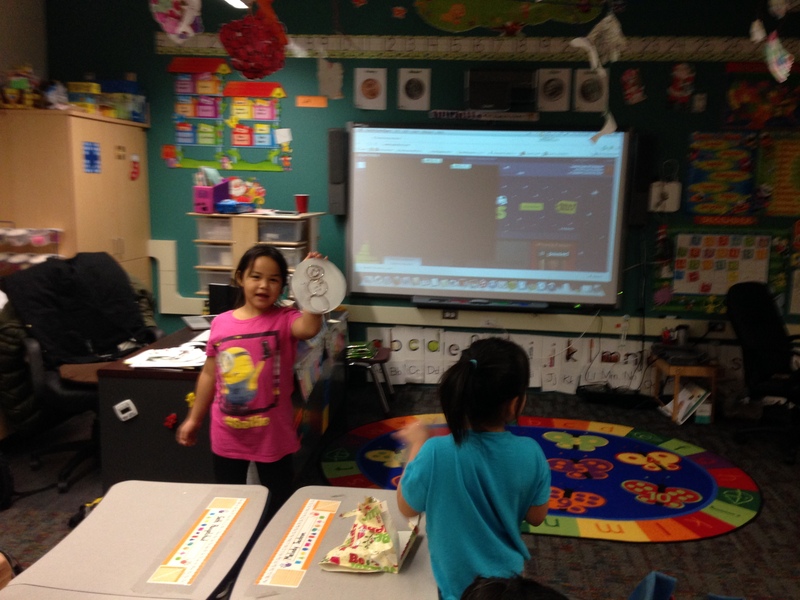 First graders have been using the website raz-kids.com. 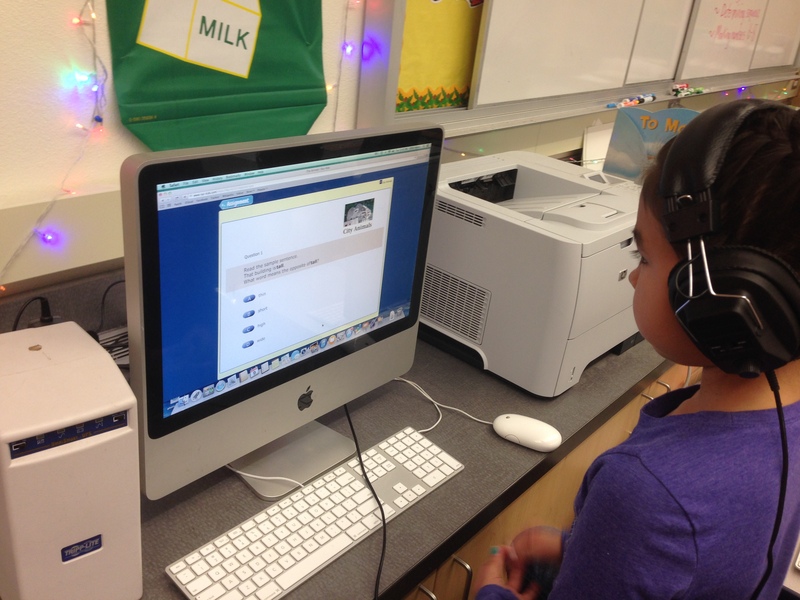 This website is an interactive fluency / reading comprehension website that ties into the guided reading program I used last year called Reading A-Z. 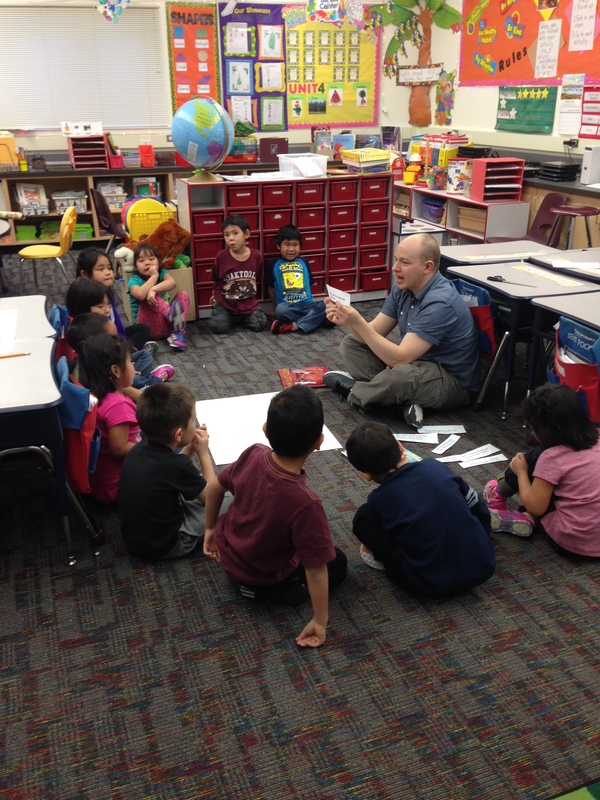 One of the biggest changes in Kindergarten is the requirement of learning sight words or words used most often in children’s literature. 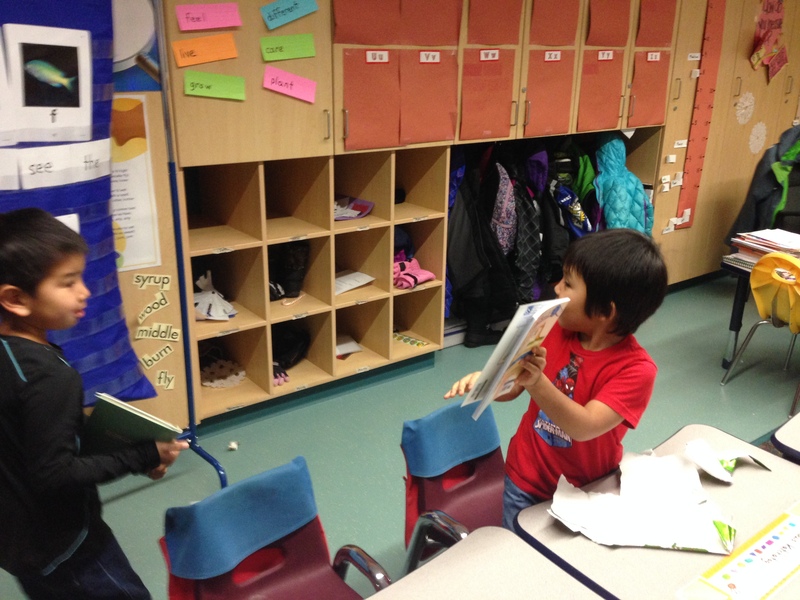 Now most schools and school districts require that by the end of kindergarten children are able to read with success, at least 20 sight words by the end of the year. 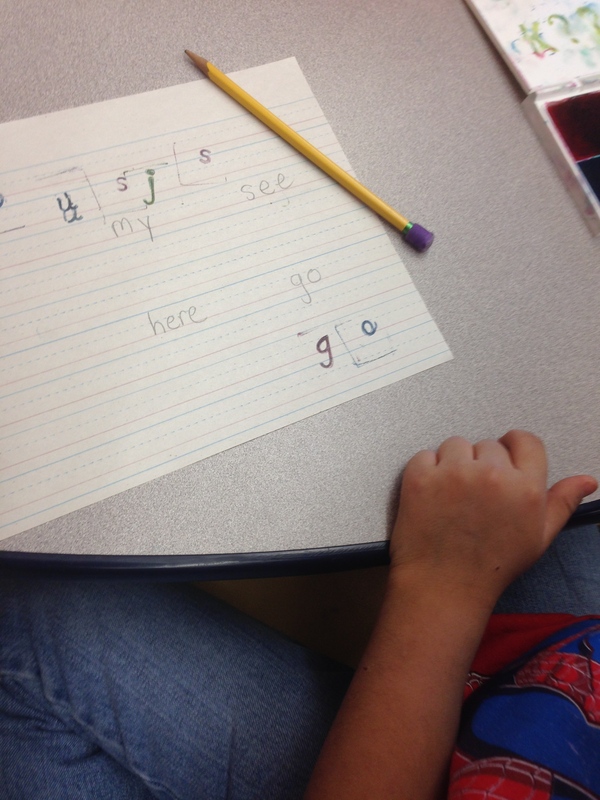 Examples of the most commonly used sight words are; a, my, the, see, I, go, can, he, she, look, like, and love. 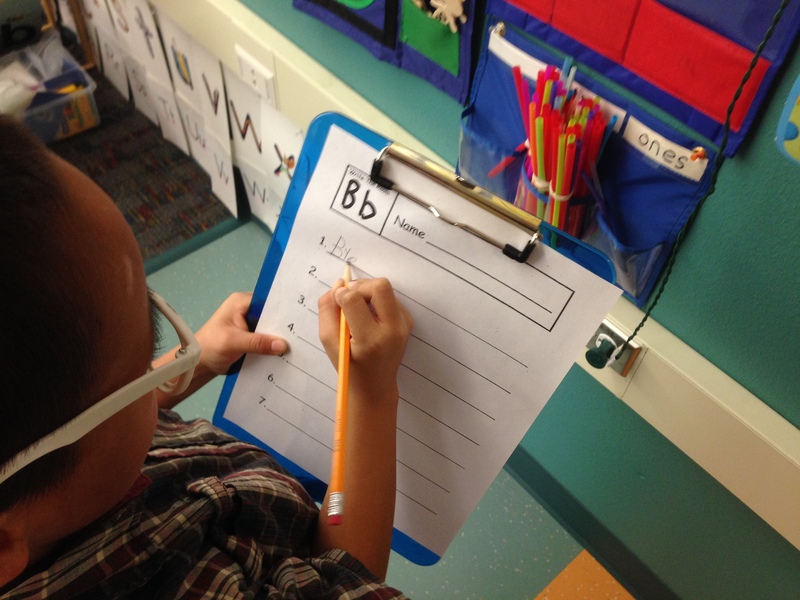 The centers above show how we can encourage students to actively recognize sight words and how they are used in sentence formation, and how to spell them. 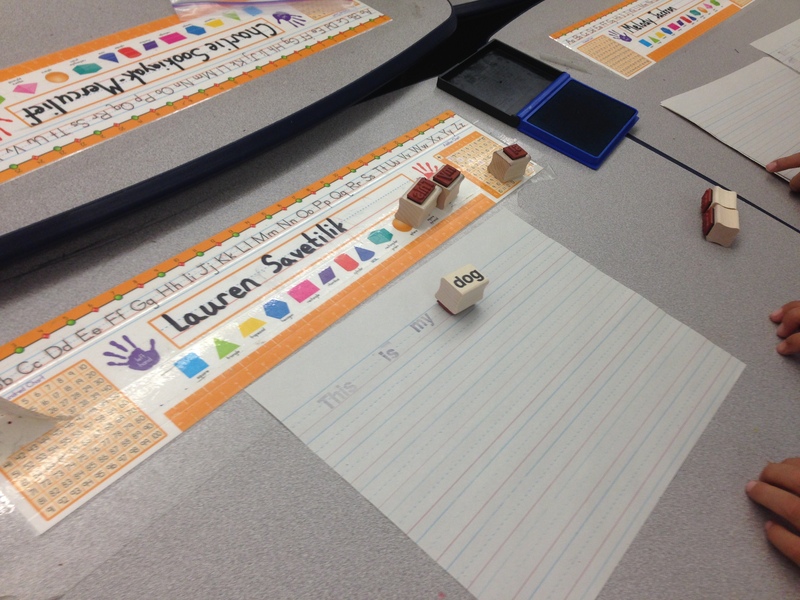 I have sight word stamps that I pre select for students and they are to put them into the correct order to form a sentence. 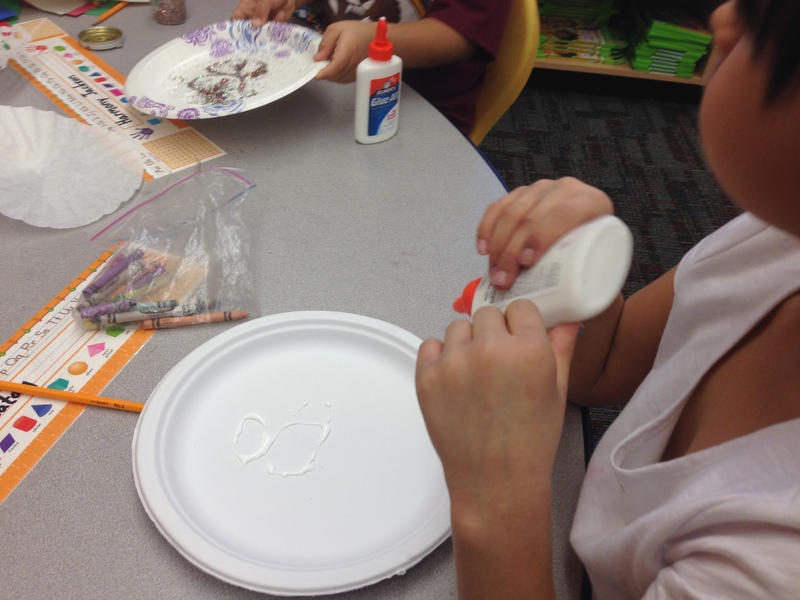 I also have alphabet letter stamps stamps where they can make the words. 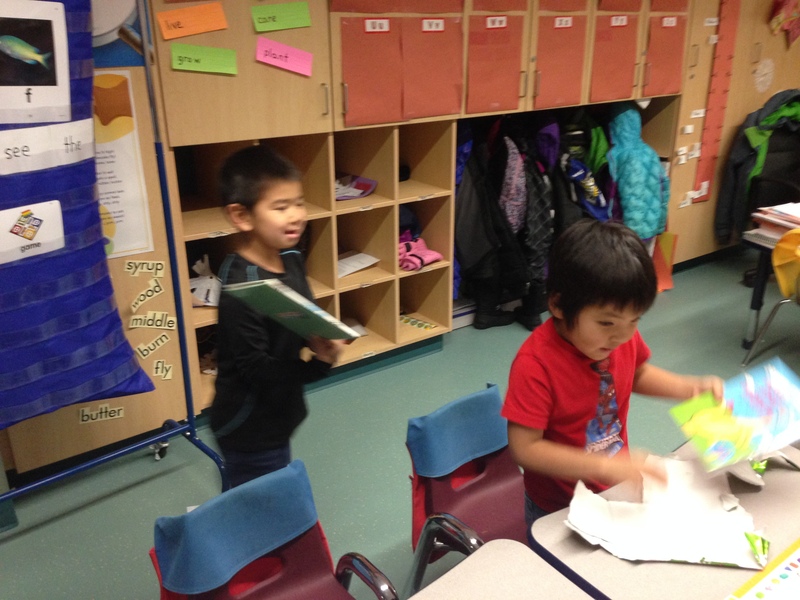 Finally our reading program provides sentences for students to partner read, I allow them to use highlighters to find the sight word of the week. 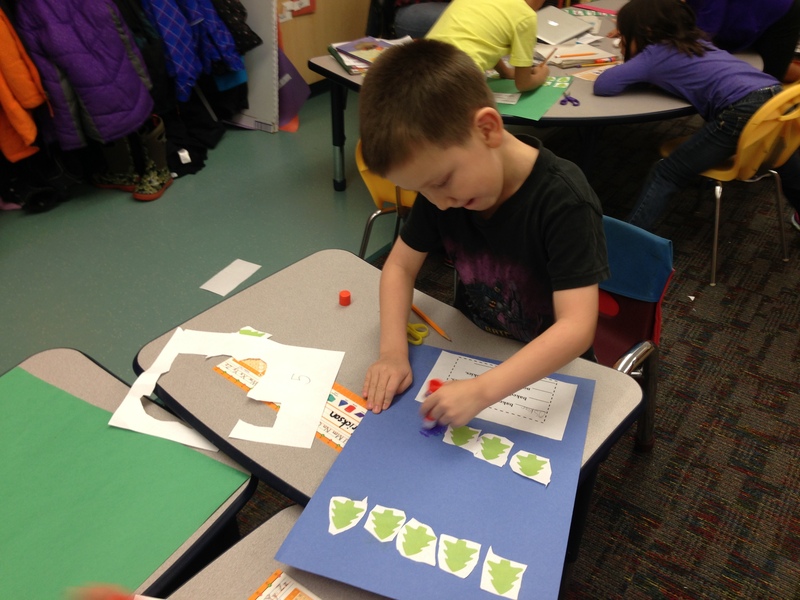 A few more examples of my centers include sequencing cards. 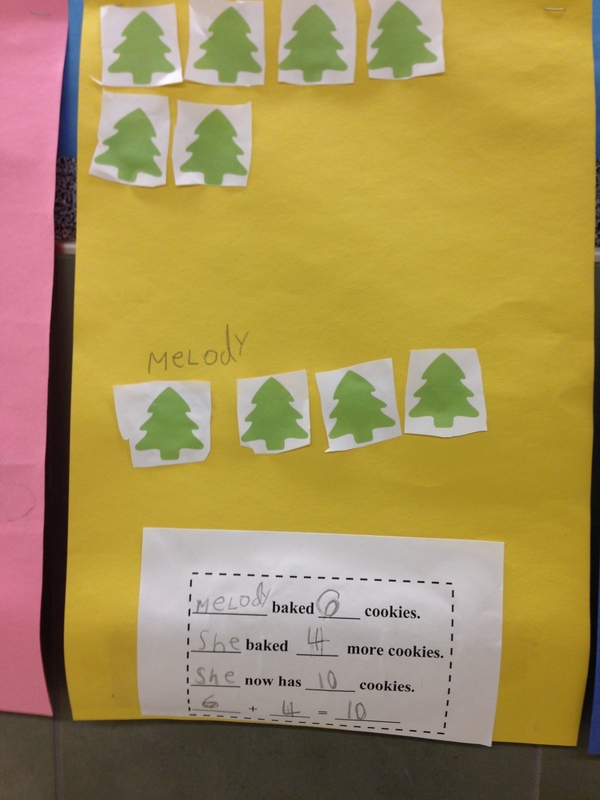 They are a set of 4 pictures that show a simple story. 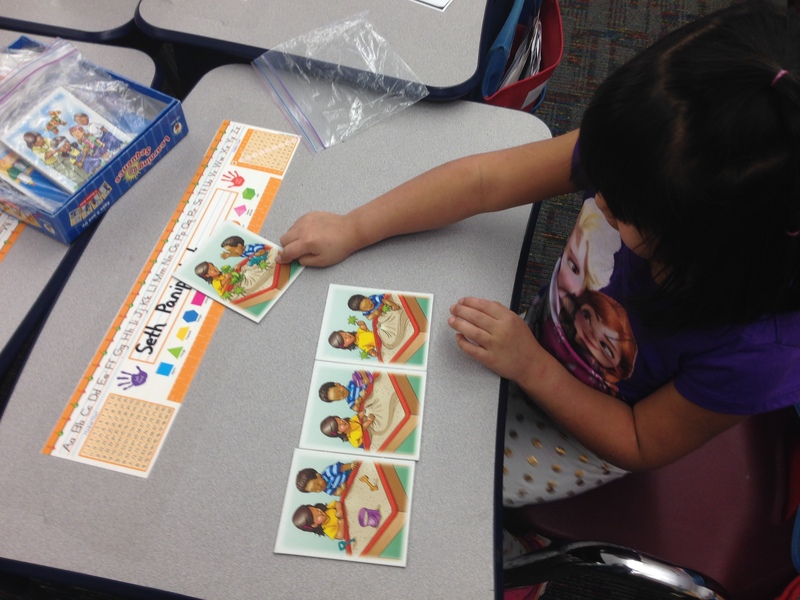 The students practice putting the pictures in the correct order in which they would happen. 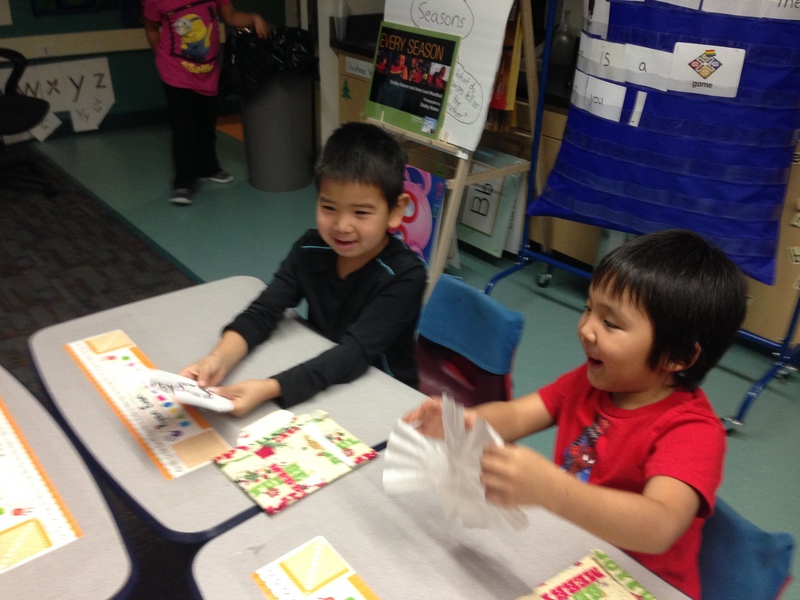 Students can flip over the cards to see if they correctly completely the activity. 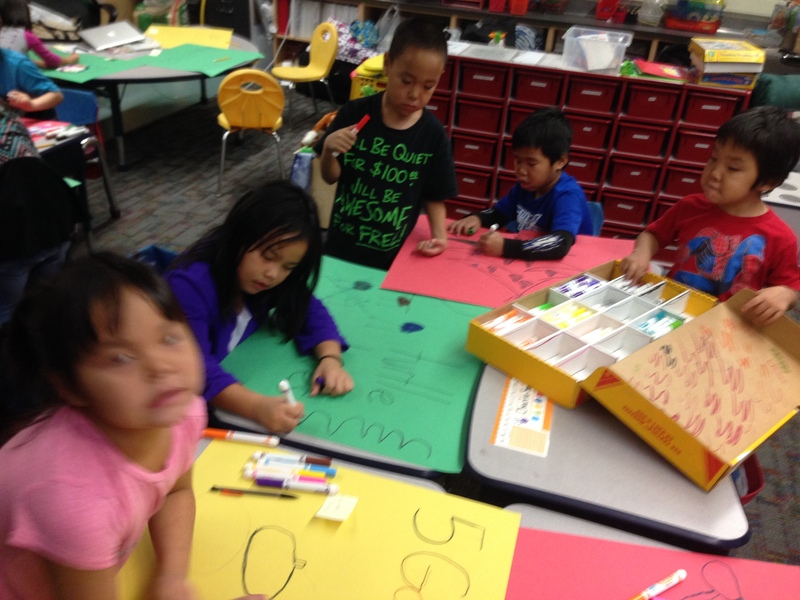 The last center is called “Write Around the Room” which is a class favorite! 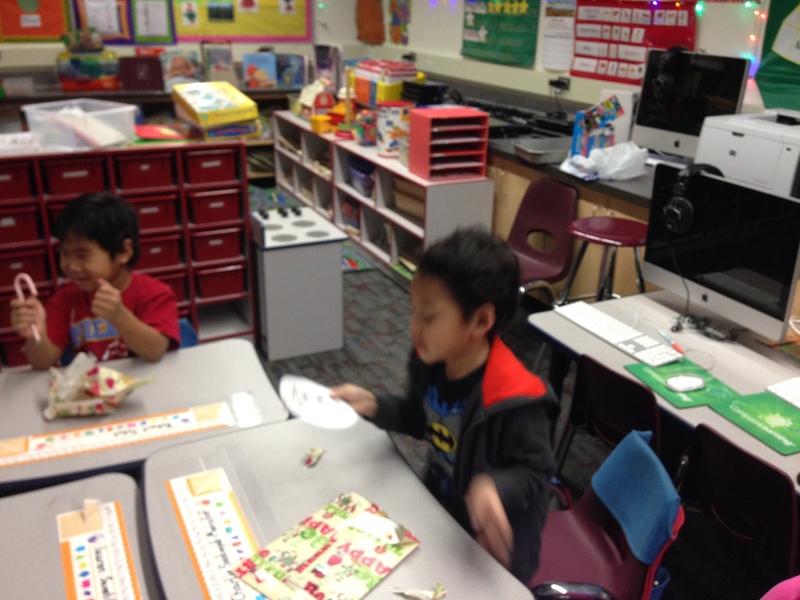 They get to put on silly fake sunglasses with the lenses popped out and they are spying for words in the room that begin with a certain letter that we are learning. 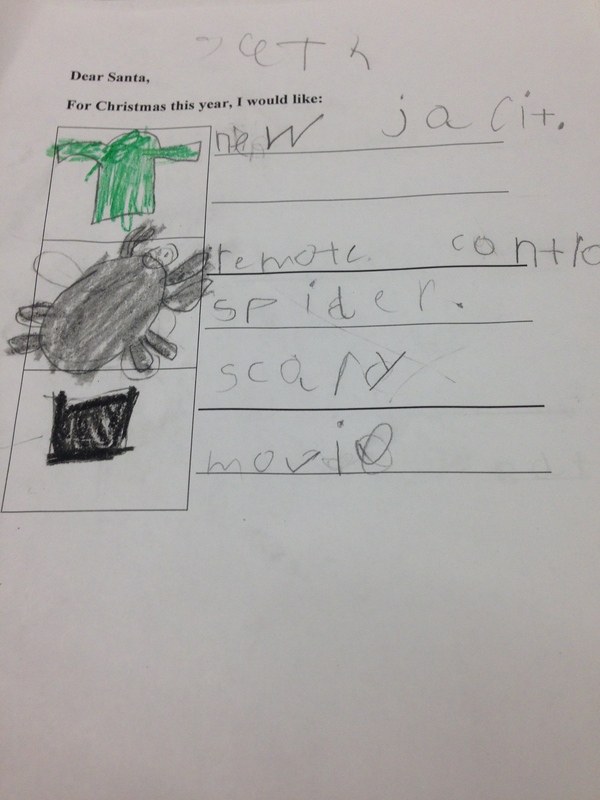 We read the story I’ve Seen Santa and continued to practice making predictions on what they think would happen next in the story. 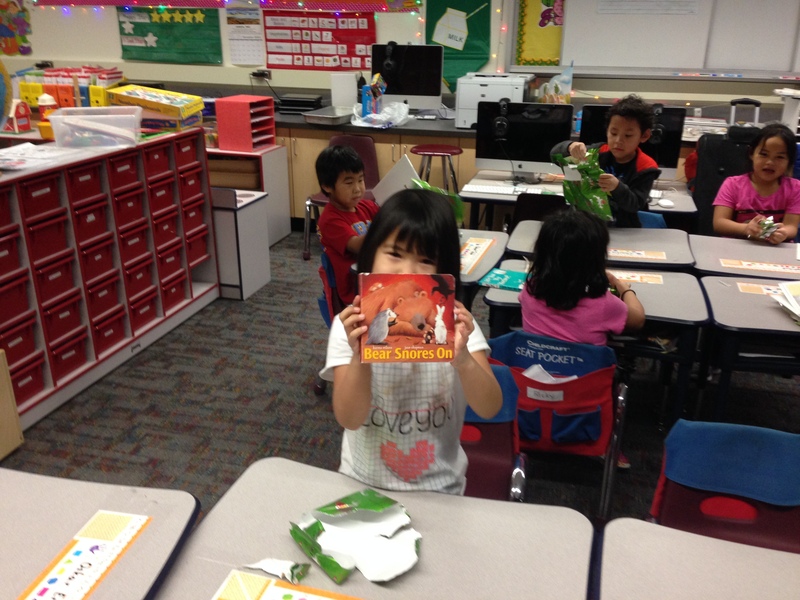 Students guessed who Little Bear would see when he goes to go check out different noises he hears downstairs. 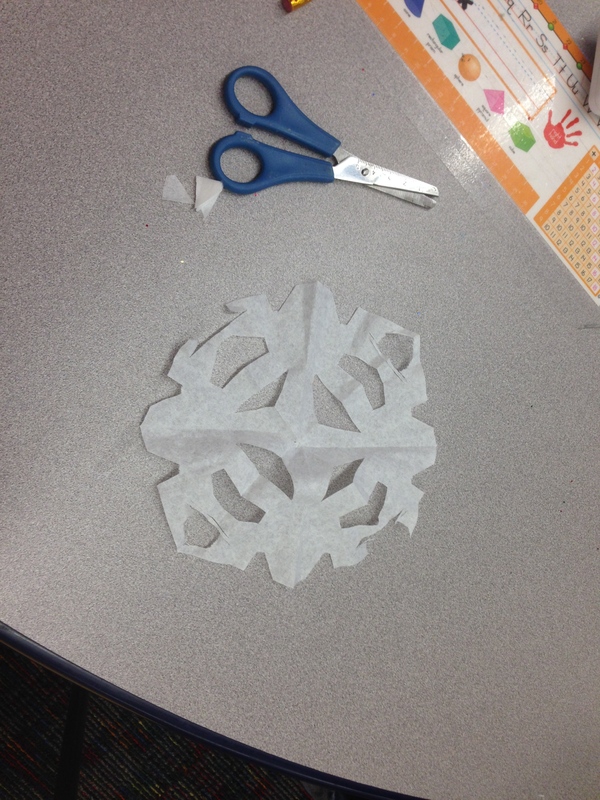 Then for math we reviewed how to make patterns and then we learned that we can make directional patterns. 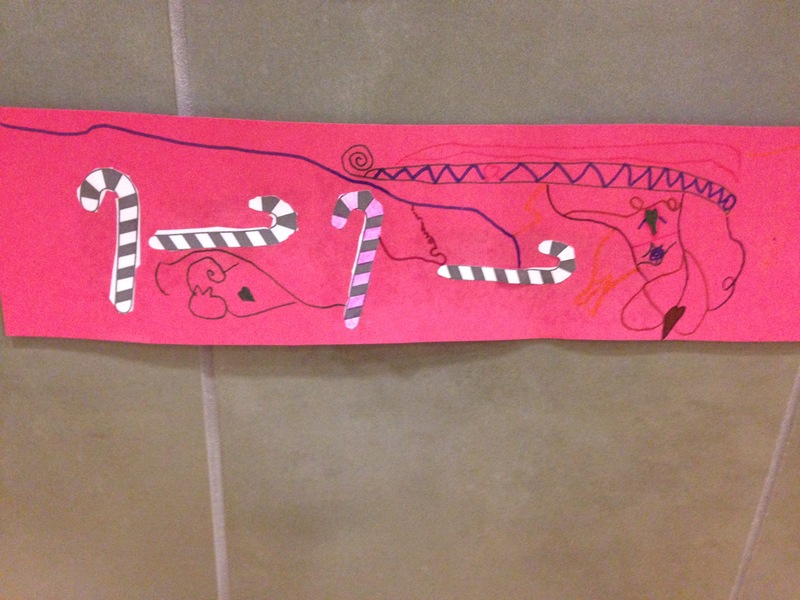 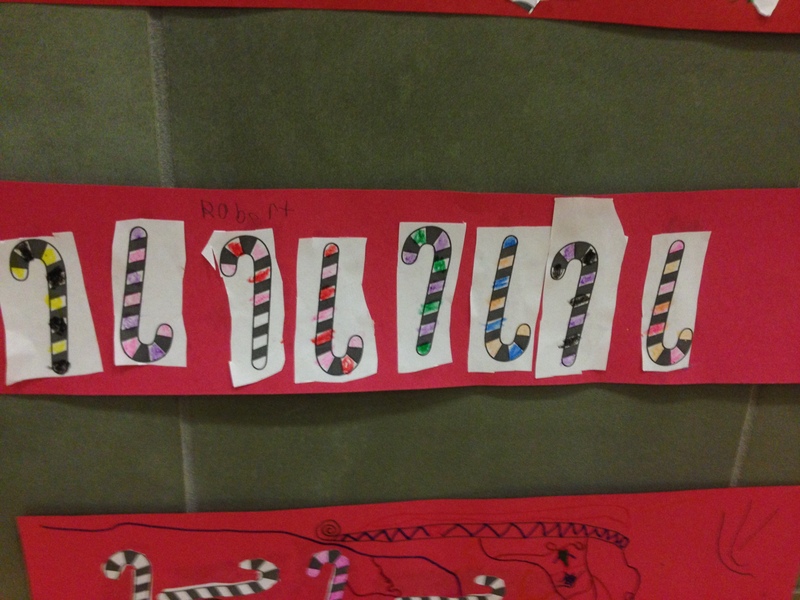 For an art activity we made candy cane patterns. 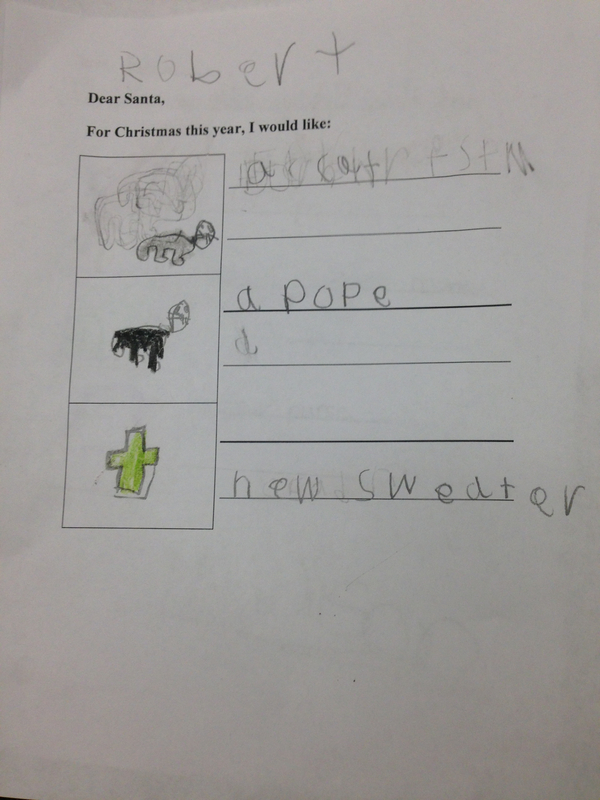 We read the book “Christmas Kitten” and made prediction on if the kitten would find a home. 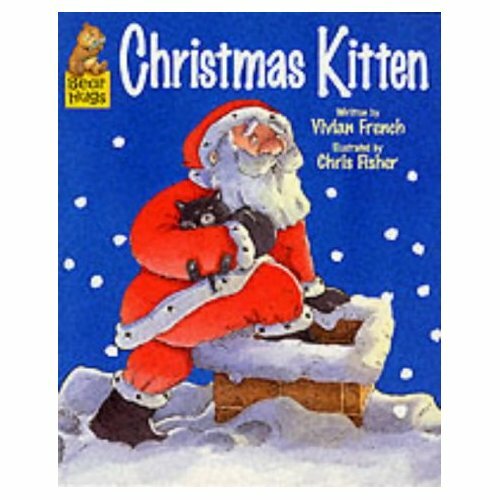 Most of the students predicted that Santa would send the homeless kitten to the little girls house because they were able to use their prior knowledge of previewing the cover. 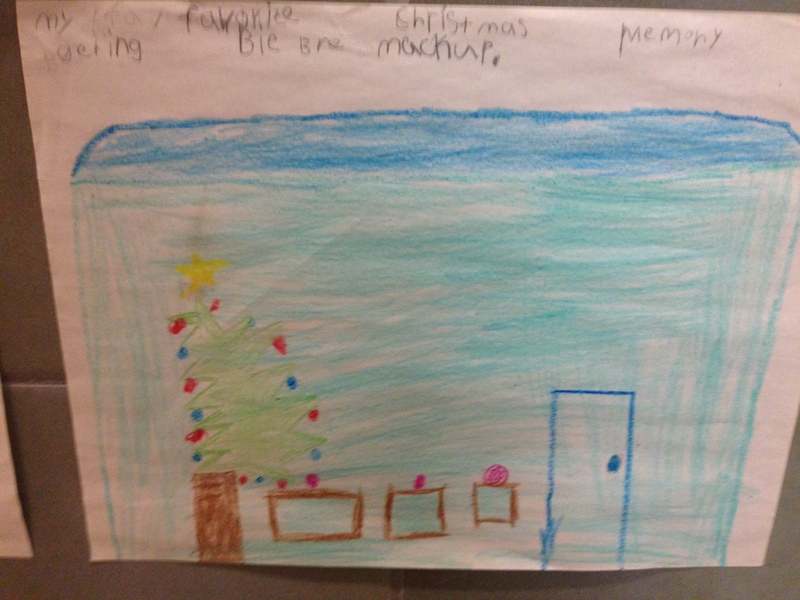 Then we wrote our own letter’s to santa, like the little girl Sophie did in the book, and we wrote three things we wanted for Christmas. 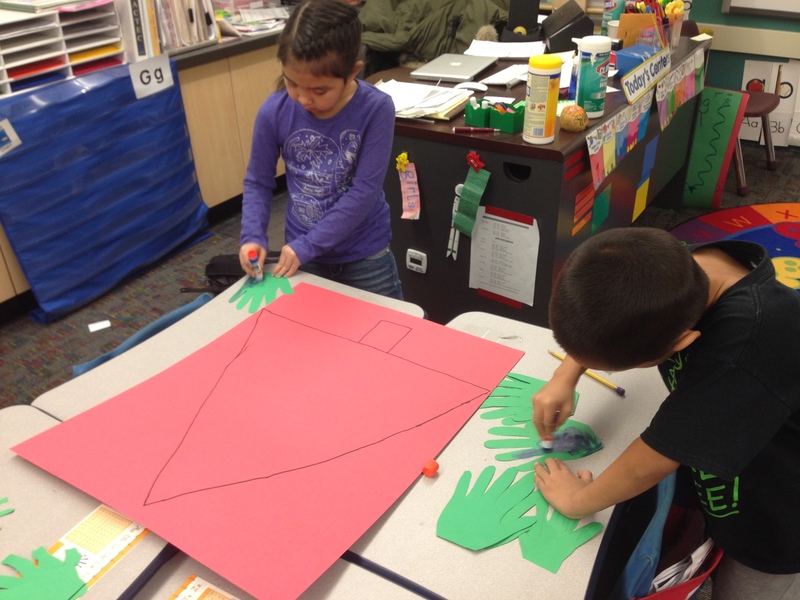 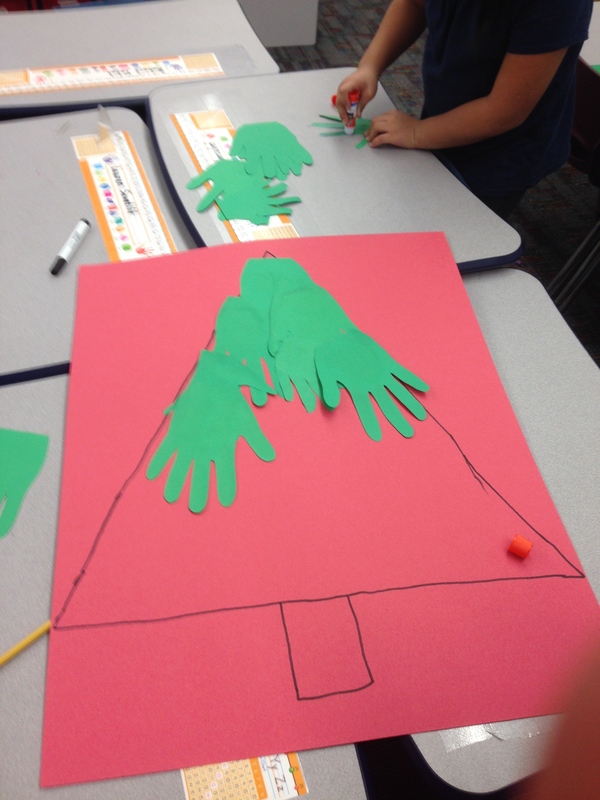 Finally we made a whole class hand cutout Christmas tree.